DEADLINE FOR SPONSORS SEPT 13 (to be included in print materials)! Looking for a GREAT way to market your business in Vienna (and beyond)? Interested in supporting YOUR community?? Become a Sponsor of Oktoberfest!! Oktoberfest Sponsors get priority booth placement and great online and print exposure! Live entertainment on three stages: Main Stage, Kid's Stage, Acoustic Stage. And LOADS and LOADS of FUN!!! This event provides an ideal venue to showcase your business to 25,000 to 35,000 attendees of all ages. You'll have the opportunity to personally interact with thousands of potential new customers. This a GREAT and AFFORDABLE way to market your business to the Greater Virginia, Maryland, DC communities! 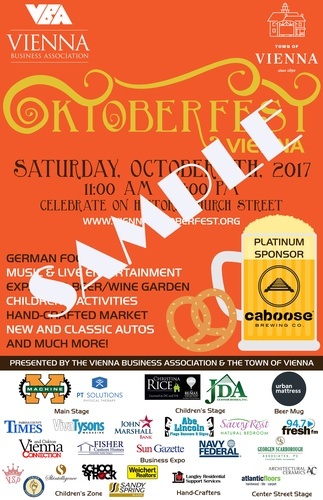 As soon as you submit your Sponsor paperwork and payment, you will start being advertised through the VBA/Oktoberfest websites, emails and social media. By submitting this form, online vendor registration form and payment you are acknowledging you have read and will abide by the Sponsor and Non-food vendor agreements. All must be received in order for your application to be a complete agreement by September 10, 2019. Platinum Title Sponsor $5,000 SOLD-Caboose Brewing Co.